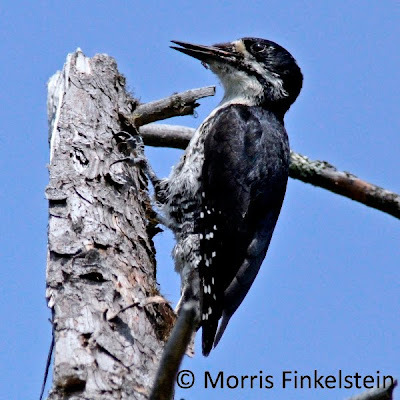 A couple weeks ago I led a small group of Connecticut Audubon Society members on a birding trip to Baxter State Park. We departed Connecticut on the morning of the 16th and headed north. To break up the drive we stopped at Kennebunk Plains for some grassland birding. Despite our arrival during the heat of the early afternoon, there were still birds to be seen. VESPER SPARROWS were conspicuous, some carrying food. BOBOLINKS and EASTERN MEADOWLARKS were actively singing. After hearing a few GRASSHOPPER SPARROWS, we finally spotted a singing bird that teed-up nicely for us. A flyby UPLAND SANDPIPER was gratifying. We did not see or hear any sign of the few Clay-colored Sparrows that had been reported here, but the time of day was likely to blame more than anything. Night at Big Moose Inn. 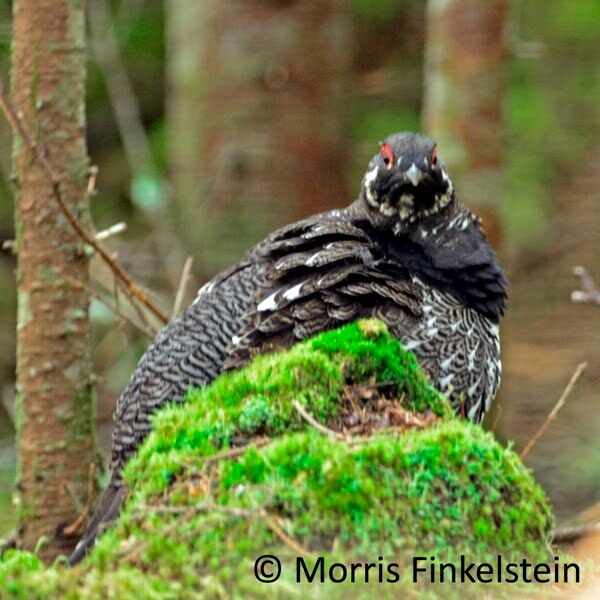 We started this day with our first try for Spruce Grouse. The park does not open until 6am (they open at 5am beginning in late June), so we arrived at the gate for opening and headed straight for the thickest boreal habitat along the Tote Road. It's about a 20-mile drive on a narrow, dirt road to the best boreal birding, so we didn't arrive until around 7am. 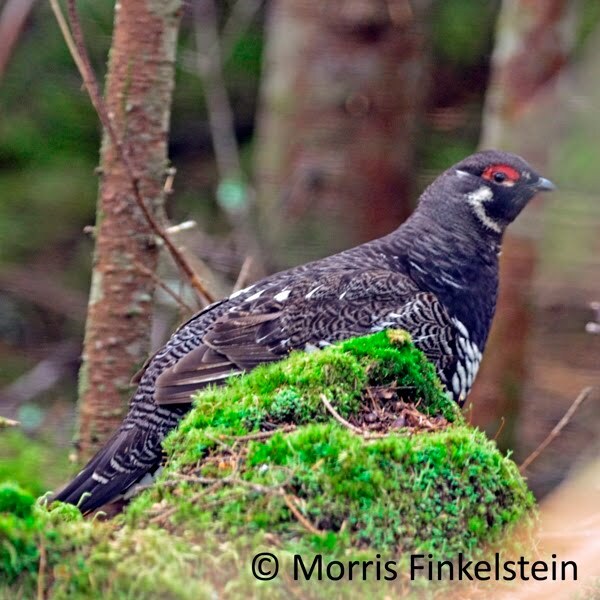 It didn't take us more than 15 minutes of driving slowly through the appropriate habitat to spot a male SPRUCE GROUSE a few yards off the road (nice spotting Marie!). The group enjoyed some really nice views of this bird as it walked slowly through the dark shadows of the thick spruce-fir forest. What a cool bird. Too easy! With the toughie out of the way, we park the van and spent the next couple hours walking and birding along the same stretch of road in search of other boreal residents and breeders. BAY-BREASTED WARBLERS were fairly common and the males were quite vocal this morning. They played hard-to-get for a while but we eventually secured scope views (!) of one cooperative singing male. A small flock of GRAY JAYS passed through to our delight. After a few more minutes we heard a BLACK-BACKED WOODPECKER calling from off the road, but it just did not want to show itself. No worries though, as it wasn't the last time we would have a shot at this bird. A little while later we were taunted by another (or the same) calling BBWO, still not in view. We then had a couple birds calling excitedly, one of which briefly perched high in a tree right along the road! Morris Finkelstein was able to grab a few photos, which I have posted below. 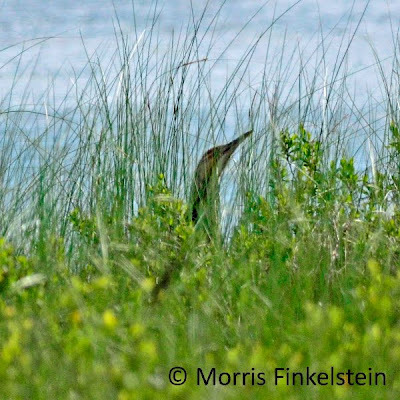 Thanks to Morris for allowing me to post a few of his photos in this report. The boreal birds kept on coming. We had multiple YELLOW-BELLIED FLYCATCHERS, FOX SPARROWS, WINTER WRENS, both KINGLETS, BLACKPOLL WARBLERS, SWAINSON'S THRUSHES and a singing LINCOLN'S SPARROW. More common warblers included MAGNOLIA, NASHVILLE, and CANADA. This stretch of boreal forest is just spectacular and worth the visit to the park by itself. 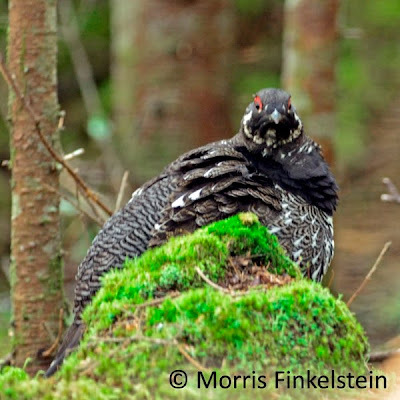 If you're looking for Spruce Grouse, this is the place to go. We headed south a bit to the Nesowadnehunk Campground for a look around. 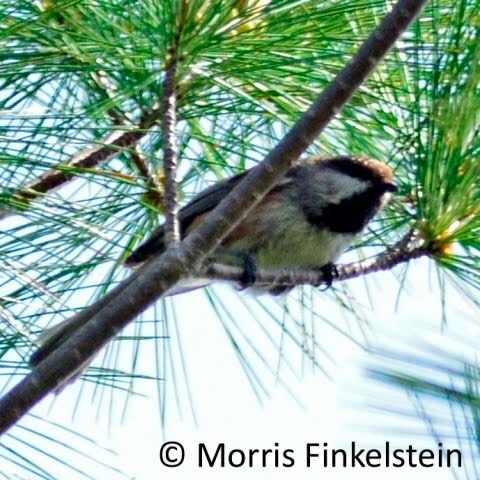 The best bird was a singing TENNESSEE WARBLER, but we weren't able to get a look. The warbler list continued to climb as we added NORTHERN PARULA and BLACK-THROATED BLUE WARBLER. Nice looks at a YELLOW-BELLIED SAPSUCKER and ALDER FLYCATCHER were new for the day. After a picnic lunch we continued to bird our way south along the Tote Road, heading back in the direction of the southern entrance gate. Miscellaneous stops at ponds and streams yielded RING-NECKED DUCKS, COMMON GOLDENEYE, and HOODED MERGANSER. After reaching the entrance gate we turned to the northeast and headed toward our destination for the afternoon: Sandy Stream Pond. Known for its moose sightings, we were hoping for a sighting of this unique ungulate. En route we had two RUFFED GROUSE cross the road at different spots, providing great opportunities to compare them to the SPRUCE GROUSE that was still fresh in our minds. We took the short hike to Sandy Stream Pond where two MOOSE were waiting for us, a young bull and an older cow, chomping away on aquatic vegetation. They seemed largely oblivious to our presence, allowing confiding views. On our walk back to the parking lot we had our most cooperative BLACKBURNIAN WARBLER of the day. It was back to Big Moose Inn for a fine dinner, drinks, and a good night's rest. On the way back, this curious RED FOX was intrigued by the big gray van from Connecticut. We awoke to overcast skies and a fine mist in the air. Determined to make the most of it, we headed back into the park and toward the Roaring Brook Campground parking lot, the park's best location for breeding Philadelphia Vireo. Unfortunately we arrived to a rain and were unable to get any decent views of the singing vireos. We pressed on, returning to Sandy Stream Pond to check for more Moose. No Moose this morning, but a hen COMMON GOLDENEYE and her six very small chicks entertained us. The weather seemed to be improving and I suggested we continue on a 2.5 mile loop trail. Bad call, Nick! Over a mile into the trail all was going well when the skies opened up. This steady pouring rain was not brief...it lasted for quite some time. The walkable trail quickly turned muddy, and the ample rocks and tree roots were as slippery as could be. We were already halfway around the loop and decided to press onward. How bad could it get?? Well, it got worse. More rain, more slippery rocks, and...a rushing stream that could only be crossed by wading up to your knees! Hey, that wasn't part of the trail description! I admit my heart was in my throat a few times, hoping that we would get through this without a major orthopedic injury! Luckily the group persevered, kept their chins up, and forded the stream successfully. We were all relieved when we arrived back at the parking lot after our little adventure. Still happy and smiling. This was a great group! As for birds along that whole stretch? It was tough to hear anything over the sound of steadily falling rain. At this point we were cold, wet, and tired. We drove back to the Inn for lunch. En route, as if my blood pressure wasn't high enough already, a moose decided to cross the road right in front of the van. A narrow miss! After hot showers and a relaxing lunch, the skies began to clear mid-afternoon (as Tom predicted, nearly to the minute!) . We were eager to get back outdoors, so we targeted some birding along the Golden Road that runs outside the southern end of the park. There are some great pockets of habitat along this road, and good birds to boot. Here we enjoyed nice looks at PINE WARBLERS and deciduous breeders like AMERICAN REDSTART and OVENBIRD. We watched an EASTERN KINGBIRD building a nest in the stump of an old dead tree. The trip's only PALM WARBLER was singing here, and one shrubby marsh held two singing WILSON'S WARBLERS that finally showed themselves after a good deal of patience. Tonight we headed into Millinocket for dinner, after which a few of us decided to head back to the Golden Road for some birding after dark. We were hoping for owls, but they were silent tonight. On this still evening we enjoyed calling WHIP-POOR-WILLS and yodeling COMMON LOONS, which were just barely audible over the raucous amphibians. Today was our last day in Maine, as we would be back in CT before dark. Not without some birding, though. I had trouble sleeping and decided to head out for some sunrise scouting along the Golden Road. I located a cooperative pair of OLIVE-SIDED FLYCATCHERS and got on another BLACK-BACKED WOODPECKER, this one a male. 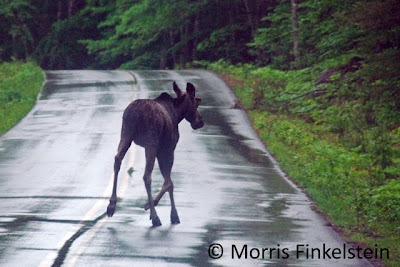 Yet another MOOSE was feeding at a roadside lake. After breakfast with the group, we headed back out to see the OS Fly's I had found earlier. The pair did not disappoint, and everyone enjoyed killer scope views. Another family of GRAY JAYS passed through. Further up the road we stopped at one of the many lakes and ponds, this one with a fair amount of open marshy habitat. 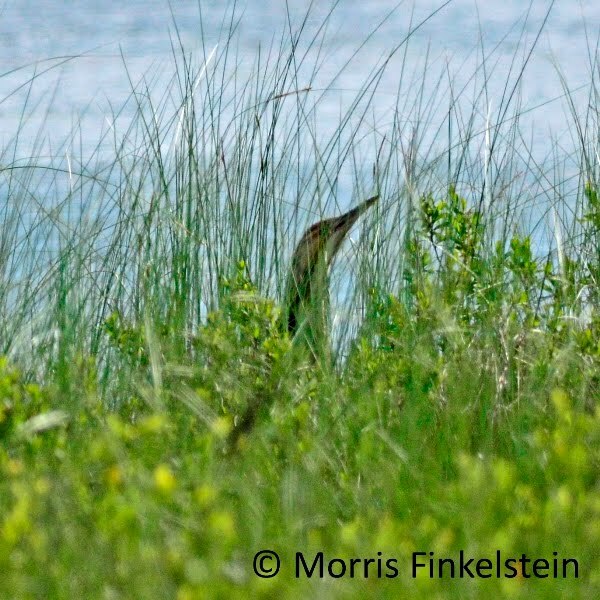 We were treated to a pumping AMERICAN BITTERN which we eventually spotted sky-pointing between rounds of gulping air. Yet further up the road we were treated to a trio of flybys: a pair of adult BALD EAGLES, a particularly aggressive PILEATED WOODPECKER, and several CLIFF SWALLOWS going to and from their nests under a bridge. Eventually we pulled ourselves away from the birding and began our trip back home. The skies cleared further and the wind really picked up. We made a short vigil for Cape May Warbler at a reliable location, but it was nearly noon by the time we arrived and the breeze was really keeping the passerines quiet. Finally, before we left the state of Maine we made a detour to Messalonskee Lake to view the BLACK TERN colony there. Our high count was five birds in view at one time from the southern boat ramp. From here it was back to Connecticut, after tallying 105 bird species as a group over those few days. I hope to lead this trip again in the future, possibly as soon as next summer. If I had to make changes to the itinerary, I would add another full day of birding the Baxter area, as we were still finding plenty of new birds up until the second we left. Alternatively, we could make this a week-long trip that includes a couple days in the Bar Harbor area to enjoy the coastal birding scene, including a bird and whale-watching trip offshore for marine mammals and puffins. Either way, I can't wait to get back up there! Hey Nick, thanks for checking out my blog - I'd fallen off the birding bandwagon for a bit with all the moving I've done recently, but I'm back in So Cal and glad to have free time to get out birding again. I am SO jealous of your moose sightings. The entire time I was in school in Vermont I was looking for a moose. Alas, it was not in the cards, but from everything I've head about their tempers maybe that's for the best. Anyhow, great blog!